There are hundreds of stories being told during the planning and anticipation of the 2017 NFL Draft. Today we will be looking at a scouting report for redshirt sophomore tight end David Njoku, Miami Hurricanes..
TE-David Njoku, Miami (FL) 6’4” 245 lbs. Cons: The athletic playmaker is a raw lump of clay with only two years of playing tight end. His routes are not refined and he needs to greatly improve his concentration as he will make a ridiculous catch, then drop an easy screen pass on the next down. After that he needs to get coached up on how to block (only gets in the way for a second or two) and spend more time developing his lower torso which isn’t Avenger-worthly. 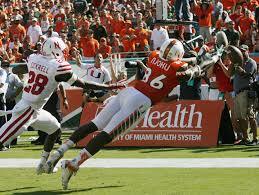 Njoku sometimes traps the pigskin with his body instead of catching it cleanly away from his body. Pros: This athletic young playmaker gets off the line of scrimmage with a combination of quick feet and disengages with his powerful arms from either the slot or conventional tight end spot. He tracks the ball well in the air and sometimes finds a way to get behind the entire defense for a big play never breaking stride. His high jumping championship form is evident when Njoku skies above defenders snaring the pigskin at its highest point. Double coverage is not an issue for this playmaker as he uses his body well to shield everyone else from the ball. The former Hurricane is great on slip screens which allow him to use his loose hips, spins, stiff-arms, hurdles, balance, and burst to get into the open field. He sets up linebackers and safeties with double moves while fighting them off with his powerful hands. Njoku has a great catch radius and seems to enjoy making plays in the middle of the gridiron fighting for extra yards and breaking tackles. The tight end works downfield to get free for his quarterback. Overall impressions: Njoku is a huge fantasy asset in the right situation. If he gets used like a young Jimmy Graham was in New Orleans by the NFL team that drafts him, the sky’s the limit for him. However, if the young tight end gets forced into playing more of a two-way role, the former Hurricane playmaker could struggle. OJ Howard’s complete game (as a receiver and blocker) is the only thing that keeps me from ranking Njoku as my top rookie tight end. Thanks for reading. I will continue to discuss my scouting reports with you throughout the few months, so keep checking the site for more content. Please check out my other content as well. You can also follow me on Twitter @AndrewMiley. « S-Jamal Adams, LSU: The best there was, the best that ever will be?